The "Expense" screen is for viewing and recording the expenses associated with purchases of animal products including feed, fencing, medication, etc... Purchases of animals that fit the user requirements for entry into the "Main Animal" screen should be entered there. Other purchases are recorded by animal type or it can be for an individual animal. Entries can be recorded daily, but it is much easier to record the total usage weekly, bi-weekly or monthly. The recommended method is to record expenses in the system on the 15th and last day of each month, or as they occur. The expense entry screen will display. Purchase Date (Required entry) Select the date of the purchase. Description (Recommended entry) Enter descriptions such as weekly total, special details, etc... The maximum length of this field is 60 characters. 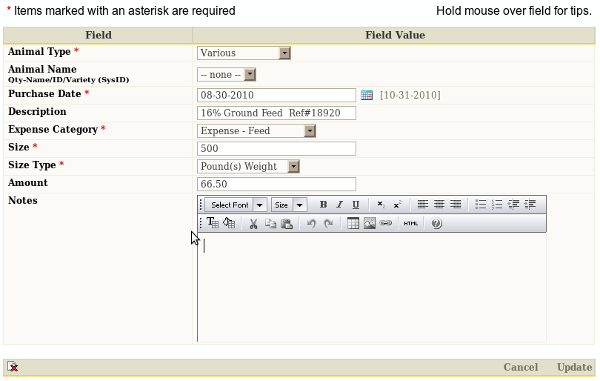 Expense Category (Required entry) Select the expense category. Amount (Required entry) Enter the Income amount paid for the purchase.